Now that the kids are back in school cold and flu season is in full swing. Here are a few tips to make sure you and your kids are ready to fight against the cold and flu. Though colds and flu’s share many symptoms- like sore throat, nasal congestion and sneezing, the flu is usually marked by more intense symptoms such as fever, fatigue, body aches and dry cough. People with a cold are more likely to have a stuffy or runny nose. That’s because colds and flu’s are caused by different viruses. The flu is caused by the influenza virus. The leading cause of the common cold is the rhino virus. There are 100+ strains of the rhino virus (“rhino” means nose). Avoid touching your eyes, nose, or mouth after being exposed to viruses or bacteria. Frequently clean surfaces such as computer keyboards, refrigerator door handles, stair rails, telephones, counter tops and door knobs to avoid hand-to-hand spread of viruses. Promote strong immune function such as switching from coffee to tea, eating garlic liberally, and adding yogurt to your diet. Drink lots of water, which flushes toxins out of your body while re-hydrating your system. Since colds and flu’s are caused by different viruses be prepared for both this season. Flu strains that hit each year vary and medical experts annually select the strains to put into a flu shot, which then helps protect against these strains only. Getting a flu shot is the best way to protect against the flu. For a cold, Healthy Moms recommends that you use Zicam, the number one pharmacist recommended cold remedy. Zicam Cold Remedy shortens the duration and it comes in a variety of forms, so you have the flexibility to choose the form you prefer. When taken at the first sign of a cold, within the first 24 to 48 hours, Zicam Cold Remedy shortens a cold’s duration and reduces its severity. Zicam works. I tried the Zicam Cold Remedy Zavors when I first started to get a cold. Instead of lasting seven to fourteen days like most colds do, I was over my cold in only four days. Zicam works, period. 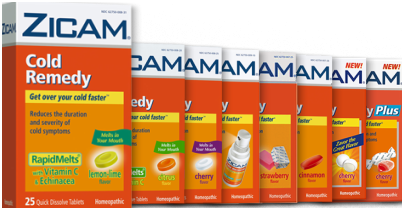 Visit Zicam.com to find a store nearest you. I swear by Zicam. As soon as any symptoms show their faces, we start it. We have been using http://www.feelingflu.com. It has an assessment tool that lets you check what your child's symptoms are and what they mean. Also specialized information for parents and pregnant women. I used zicam for the first time a few days ago and yes yes yes it works! Someone mentioned it to dh and oh yes!